You are here: Home Children's Furniture Guides, Inspiration & News Children's Beds Guides, Inspiration & News Introducing the New Lifetime Play Learn & Sleep Bed! Introducing the New Lifetime Play Learn & Sleep Bed! Posted on April 3, 2017	by Zebarella	in Children's Beds Guides, Inspiration & News, Children's Furniture Guides, Inspiration & News, Parenting Tips	with No Comments on Introducing the New Lifetime Play Learn & Sleep Bed! The new Lifetime bed is quite simply the bed of a lifetime – and we don’t say that (err) lying down! Our buying team is constantly bombarded (but in a nice way!) with images from designers and manufacturers thrilled to show us their latest wow, weird and mostly wonderful designs and creations … but rest assured, until now, we’ve never seen anything quite like this piece of Scandinavian sleeping furniture! Plenty of more extravagant and elaborate designs yes but never something so nifty in design and thrifty on price (its only £595!!). 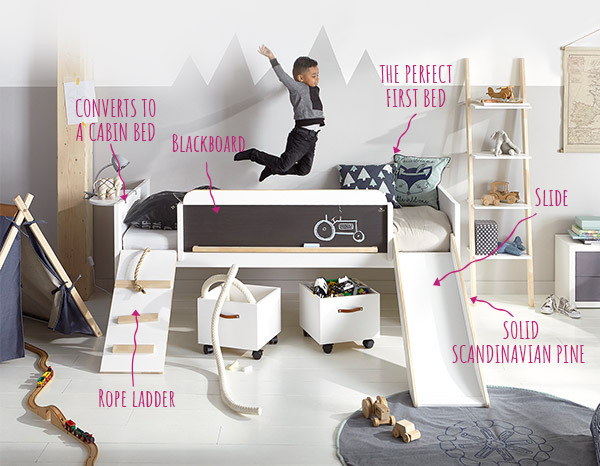 This limited edition Play, Learn and Sleep Bed is the first luxury yet affordable unit to be made by our high end Danish manufacturers, Lifetime. As well as giving your brood a plush base where they can rest their sleepy head at night, it offers kids a way to develop their creative skills whilst having the time of their lives. It comes with an array of adaptable features that allow you to tailor the unit as your little one grows, making it a smarty-pants investment for any kid’s bedroom. This is the solution parents have been screaming for when it comes to finding the perfect bed for their child. Here’s everything you need to know about the Play, Learn and Sleep Bed, as well as some juicy details explaining why we’re getting quite so excited about it. When your child finally outgrows their cot bed and begins to wander into your room at night, it poses a bit of a dilemma. Do you pick out the novelty toddler bed of their dreams, knowing that it won’t last forever, or do you take the plunge with a grown-up bed from the off? Thankfully, you don’t need to debate this age-old issue any longer. The Play, Learn and Sleep unit straddles both ends of the kids’ bed spectrum with ease, making it a natural progression from the cot bed for those growing bones. It’s just the right height for tots, with a handy ladder and slide to help them navigate mornings and nights independently. Not only is this Lifetime unit the perfect size for toddlers making the big move from cot to bed, it is also undeniably attractive to any young child with reservations about sleeping on their own. It’s equipped with a host of playing features that are sure to dazzle them as they wait for the Sandman to come. Kids want to feel like grown-ups, but when they’re taken out of their comfort zone for real, it often makes them feel uneasy. The Play, Learn and Sleep Bed is just grown-up enough to get kids excited, but not too adult to intimidate them. Kids’ beds are notorious for their fleeting lifespans, with dusty board-games and toys often lasting for a longer time than your little one’s sleeping bunk. This is because children have a habit of growing multiple inches overnight and suddenly developing artful opinions on taste and style. One morning you’ll notice their toes are tipping over the far end of the bed, and the next you’ll be greeted by some grumpy diatribe about wanting “cooler” sleeping material. This all-too-familiar family furniture pickle has finally been addressed thanks to the Play, Learn and Sleep Bed. The unit arrives with a funky slide and climbing frame for when your kids are carefree and full of beans, but as soon as they begin to think they’re a bit too cool for school, you can remove these features to transform the unit into a stylish, more mature bed. 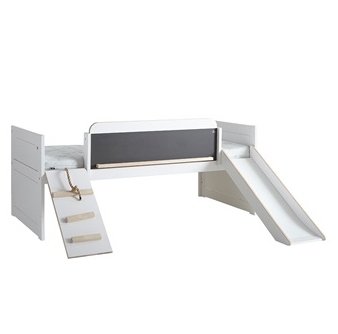 Another awesome feature is the adaptable storage space hidden underneath. A set of pearly white boxes with fitted wheels can be slipped below the bed and easily removed at a moment’s notice. There’s ample space inside to fit all manner of items too, allowing you to swap play toys for books when your child’s a little older. Getting your child to go to bed in the evenings can sometimes feel like an impossible task. But never fear, you no longer have to spend your nights negotiating when it’s time to hit the hay. 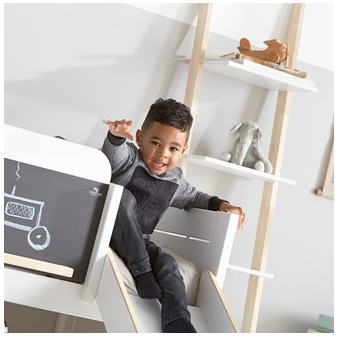 The great thing about the Play, Learn and Sleep Bed is that your son/daughter will be asking about their bedtime as soon they’re in from nursery or school. There’s so much to entertain them, they won’t want to be anywhere else! The new Lifetime bed is packed with activities that are sure to keep your child amused for hours on end. These include a chalkboard front, which can help to inspire and improve their creativity, whilst also offering a perfect place to practice handwriting. The climbing ramp and slide allow them to run off a bit of steam and develop their co-ordination, whilst the bed itself offers a blissful night’s sleep that’s sure to see your munchkin waking up in the morning feeling completely refreshed. The way in which the Play, Learn and Sleep Bed admirably combines playtime and rest just goes to show that this is an all-round better bed quite unlike any other on the market. Oh, and it’s an absolute steal! Stylish, versatile, and comfortable Scandi beds like this don’t come cheap… except in this case. At £595, the Play, Learn and Sleep Bed is astonishing value for money – especially when you factor in the luxury design and all of the amazing benefits to boot. Authentic Scandinavian pine (from sustainable forests) is the core material, complemented by a hint of birch wood and rounded off with a crisp white lacquered finish. The new Lifetime bed is the very definition of high-quality children’s bedroom furniture, and its longevity and adaptability means you won’t need to replace it for years. There are also a range of additional products available for purchase that act as perfect accompaniments to the Play, Learn and Sleep Bed, including the Teepee Play Tent (£175); 2 Drawer Chest, (£275); and Bookcase Ladder (£149). If you want to learn more about the new Lifetime bed or just fancy a chinwag about Cuckoolands Kids Beds in general, give our Dream-team a call on +44 (0) 1305 231231. We love chatting about all the wow (sometimes weird) and always wonderful products we source from various far flung places across the world, so don’t be afraid to pick up the phone and get in touch! « Cuckooland are proud to introduce Circu!